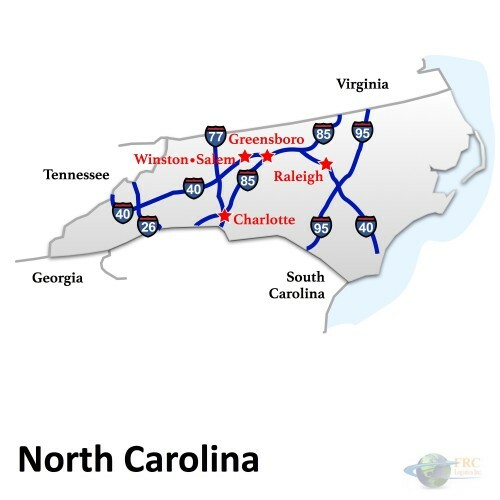 Maryland to North Carolina Freight shipping and trucking services are in high demand; Baltimore to Greensboro is a very heavily traveled route. The Baltimore, MD to Greensboro, NC freight shipping lane is a 355 mile haul that takes more than 6 hours of driving to complete. Shipping from Maryland to North Carolina ranges from a minimum of 172 miles and over 3 hours on the road from Newburg, MD to Wise, NC, to over 674 miles and a minimum driving time of 11 hours on the road from Elk Mills, MD to Murphy, NC. The shortest route from Maryland to North Carolina is along I-95 S; however, there’s also a more westerly route that uses the US-29 S, passing through Lynchburg instead of Richmond, VA.